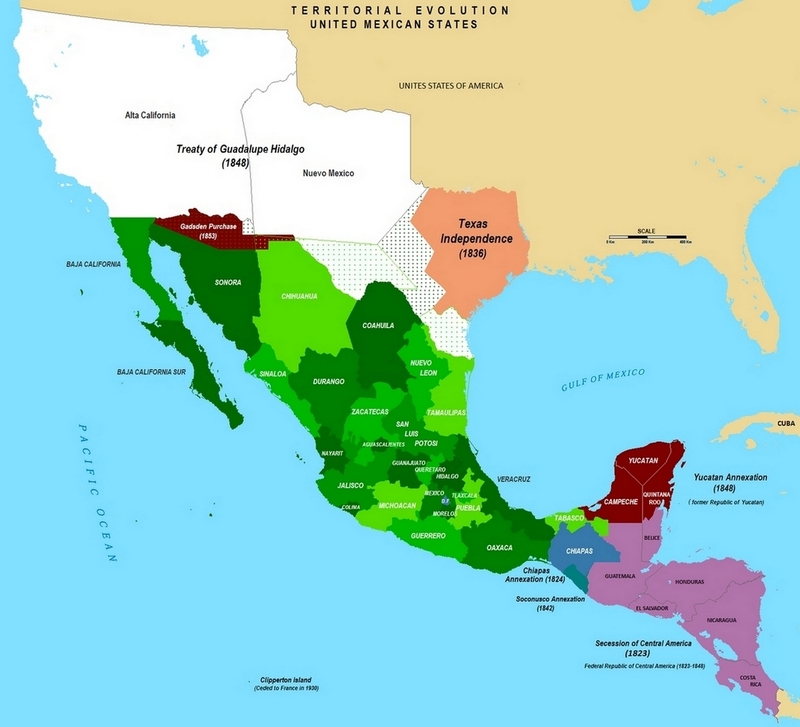 The Treaty of Guadalupe Hidalgo in 1848, also known as the Mexican Cession, was a treaty that formalized the cessation of hostilities between Mexico and the United States as a result of the Mexican-American War (1846-1848). The Treaty of Guadalupe Hidalgo contains 23 articles and it was signed on February 2, 1848. In November 1835, the northern part of the Mexican state of Coahuila-Tejas declared itself in revolt against Mexico's new centralist government headed by President Antonio López de Santa Anna. By February 1836, Texans declared their territory to be independent and that its border extended to the Rio Grande rather than the Rio Nueces that Mexicans recognized as the dividing line. Although the Texans proclaimed themselves citizens of the Independent Republic of Texas on April 21, 1836 following their victory over the Mexicans at the Battle of San Jacinto, Mexicans continued to consider Tejas a rebellious province that they would reconquer someday. In December 1845, the U.S. Congress voted to annex the Texas Republic and soon sent troops led by General Zachary Taylor to the Rio Grande (regarded by Mexicans as their territory) to protect its border with Mexico. The inevitable clashes between Mexican troops and U.S. forces provided the rationale for a Congressional declaration of war on May 13, 1846. Hostilities continued for the next two years as General Taylor led his troops through to Monterrey, and General Stephen Kearny and his men went to New Mexico, Chihuahua, and California. But it was General Winfield Scott and his army that delivered the decisive blows as they marched from Veracruz to Puebla and finally captured Mexico City itself in August 1847. Mexican officials and Nicholas Trist, President Polk's representative, began discussions for a peace treaty that August. On February 2, 1848 the Treaty was signed in Guadalupe Hidalgo, a city north of the capital where the Mexican government had fled as U.S. troops advanced. Its provisions called for Mexico to cede 55% of its territory (present-day Arizona, California, New Mexico, and parts of Colorado, Nevada and Utah) in exchange for fifteen million dollars in compensation for war-related damage to Mexican property. Other provisions stipulated the Texas border at the Rio Grande (Article V), protection for the property and civil rights of Mexican nationals living within the new border (Articles VIII and IX), U.S. promise to police its side of the border (Article XI), and compulsory arbitration of future disputes between the two countries (Article XXI). When the U.S. Senate ratified the treaty in March, it reduced Article IX and deleted Article X guaranteeing the protection of Mexican land grants. Following the Senate's ratification of the treaty, U.S. troops left Mexico City. The United States of America and the United Mexican States animated by a sincere desire to put an end to the calamities of the war which unhappily exists between the two Republics and to establish Upon a solid basis relations of peace and friendship, which shall confer reciprocal benefits upon the citizens of both, and assure the concord, harmony, and mutual confidence wherein the two people should live, as good neighbors have for that purpose appointed their respective plenipotentiaries, that is to say: The President of the United States has appointed Nicholas P. Trist, a citizen of the United States, and the President of the Mexican Republic has appointed Don Luis Gonzaga Cuevas, Don Bernardo Couto, and Don Miguel Atristain, citizens of the said Republic; Who, after a reciprocal communication of their respective full powers, have, under the protection of Almighty God, the author of peace, arranged, agreed upon, and signed the following: Treaty of Peace, Friendship, Limits, and Settlement between the United States of America and the Mexican Republic. There shall be firm and universal peace between the United States of America and the Mexican Republic, and between their respective countries, territories, cities, towns, and people, without exception of places or persons. Immediately upon the signature of this treaty, a convention shall be entered into between a commissioner or commissioners appointed by the General-in-chief of the forces of the United States, and such as may be appointed by the Mexican Government, to the end that a provisional suspension of hostilities shall take place, and that, in the places occupied by the said forces, constitutional order may be reestablished, as regards the political, administrative, and judicial branches, so far as this shall be permitted by the circumstances of military occupation. Immediately upon the ratification of the present treaty by the Government of the United States, orders shall be transmitted to the commanders of their land and naval forces, requiring the latter (provided this treaty shall then have been ratified by the Government of the Mexican Republic, and the ratifications exchanged) immediately to desist from blockading any Mexican ports and requiring the former (under the same condition) to commence, at the earliest moment practicable, withdrawing all troops of the United States then in the interior of the Mexican Republic, to points that shall be selected by common agreement, at a distance from the seaports not exceeding thirty leagues; and such evacuation of the interior of the Republic shall be completed with the least possible delay; the Mexican Government hereby binding itself to afford every facility in its power for rendering the same convenient to the troops, on their march and in their new positions, and for promoting a good understanding between them and the inhabitants. In like manner orders shall be despatched to the persons in charge of the custom houses at all ports occupied by the forces of the United States, requiring them (under the same condition) immediately to deliver possession of the same to the persons authorized by the Mexican Government to receive it, together with all bonds and evidences of debt for duties on importations and on exportations, not yet fallen due. Moreover, a faithful and exact account shall be made out, showing the entire amount of all duties on imports and on exports, collected at such custom-houses, or elsewhere in Mexico, by authority of the United States, from and after the day of ratification of this treaty by the Government of the Mexican Republic; and also an account of the cost of collection; and such entire amount, deducting only the cost of collection, shall be delivered to the Mexican Government, at the city of Mexico, within three months after the exchange of ratifications. The evacuation of the capital of the Mexican Republic by the troops of the United States, in virtue of the above stipulation, shall be completed in one month after the orders there stipulated for shall have been received by the commander of said troops, or sooner if possible. Immediately after the exchange of ratifications of the present treaty all castles, forts, territories, places, and possessions, which have been taken or occupied by the forces of the United States during the present war, within the limits of the Mexican Republic, as about to be established by the following article, shall be definitely restored to the said Republic, together with all the artillery, arms, apparatus of war, munitions, and other public property, which were in the said castles and forts when captured, and which shall remain there at the time when this treaty shall be duly ratified by the Government of the Mexican Republic. To this end, immediately upon the signature of this treaty, orders shall be despatched to the American officers commanding such castles and forts, securing against the removal or destruction of any such artillery, arms, apparatus of war, munitions, or other public property. The city of Mexico, within the inner line of intrenchments surrounding the said city, is comprehended in the above stipulation, as regards the restoration of artillery, apparatus of war, & c.
The final evacuation of the territory of the Mexican Republic, by the forces of the United States, shall be completed in three months from the said exchange of ratifications, or sooner if possible; the Mexican Government hereby engaging, as in the foregoing article to use all means in its power for facilitating such evacuation, and rendering it convenient to the troops, and for promoting a good understanding between them and the inhabitants. If, however, the ratification of this treaty by both parties should not take place in time to allow the embarcation of the troops of the United States to be completed before the commencement of the sickly season, at the Mexican ports on the Gulf of Mexico, in such case a friendly arrangement shall be entered into between the General-in-Chief of the said troops and the Mexican Government, whereby healthy and otherwise suitable places, at a distance from the ports not exceeding thirty leagues, shall be designated for the residence of such troops as may not yet have embarked, until the return of the healthy season. And the space of time here referred to as, comprehending the sickly season shall be understood to extend from the first day of May to the first day of November. All prisoners of war taken on either side, on land or on sea, shall be restored as soon as practicable after the exchange of ratifications of this treaty. It is also agreed that if any Mexicans should now be held as captives by any savage tribe within the limits of the United States, as about to be established by the following article, the Government of the said United States will exact the release of such captives and cause them to be restored to their country. The boundary line between the two Republics shall commence in the Gulf of Mexico, three leagues from land, opposite the mouth of the Rio Grande, otherwise called Rio Bravo del Norte, or Opposite the mouth of its deepest branch, if it should have more than one branch emptying directly into the sea; from thence up the middle of that river, following the deepest channel, where it has more than one, to the point where it strikes the southern boundary of New Mexico; thence, westwardly, along the whole southern boundary of New Mexico (which runs north of the town called Paso) to its western termination; thence, northward, along the western line of New Mexico, until it intersects the first branch of the river Gila; (or if it should not intersect any branch of that river, then to the point on the said line nearest to such branch, and thence in a direct line to the same); thence down the middle of the said branch and of the said river, until it empties into the Rio Colorado; thence across the Rio Colorado, following the division line between Upper and Lower California, to the Pacific Ocean. The southern and western limits of New Mexico, mentioned in the article, are those laid down in the map entitled "Map of the United Mexican States, as organized and defined by various acts of the Congress of said republic, and constructed according to the best authorities. Revised edition. Published at New York, in 1847, by J. Disturnell," of which map a copy is added to this treaty, bearing the signatures and seals of the undersigned Plenipotentiaries. And, in order to preclude all difficulty in tracing upon the ground the limit separating Upper from Lower California, it is agreed that the said limit shall consist of a straight line drawn from the middle of the Rio Gila, where it unites with the Colorado, to a point on the coast of the Pacific Ocean, distant one marine league due south of the southernmost point of the port of San Diego, according to the plan of said port made in the year 1782 by Don Juan Pantoja, second sailing-master of the Spanish fleet, and published at Madrid in the year 1802, in the atlas to the voyage of the schooners Sutil and Mexicana; of which plan a copy is hereunto added, signed and sealed by the respective Plenipotentiaries. In order to designate the boundary line with due precision, upon authoritative maps, and to establish upon the ground land-marks which shall show the limits of both republics, as described in the present article, the two Governments shall each appoint a commissioner and a surveyor, who, before the expiration of one year from the date of the exchange of ratifications of this treaty, shall meet at the port of San Diego, and proceed to run and mark the said boundary in its whole course to the mouth of the Rio Bravo del Norte. They shall keep journals and make out plans of their operations; and the result agreed upon by them shall be deemed a part of this treaty, and shall have the same force as if it were inserted therein. The two Governments will amicably agree regarding what may be necessary to these persons, and also as to their respective escorts, should such be necessary. The boundary line established by this article shall be religiously respected by each of the two republics, and no change shall ever be made therein, except by the express and free consent of both nations, lawfully given by the General Government of each, in conformity with its own constitution. The vessels and citizens of the United States shall, in all time, have a free and uninterrupted passage by the Gulf of California, and by the river Colorado below its confluence with the Gila, to and from their possessions situated north of the boundary line defined in the preceding article; it being understood that this passage is to be by navigating the Gulf of California and the river Colorado, and not by land, without the express consent of the Mexican Government. If, by the examinations which may be made, it should be ascertained to be practicable and advantageous to construct a road, canal, or railway, which should in whole or in part run upon the river Gila, or upon its right or its left bank, within the space of one marine league from either margin of the river, the Governments of both republics will form an agreement regarding its construction, in order that it may serve equally for the use and advantage of both countries. The river Gila, and the part of the Rio Bravo del Norte lying below the southern boundary of New Mexico, being, agreeably to the fifth article, divided in the middle between the two republics, the navigation of the Gila and of the Bravo below said boundary shall be free and common to the vessels and citizens of both countries; and neither shall, without the consent of the other, construct any work that may impede or interrupt, in whole or in part, the exercise of this right; not even for the purpose of favoring new methods of navigation. Nor shall any tax or contribution, under any denomination or title, be levied upon vessels or persons navigating the same or upon merchandise or effects transported thereon, except in the case of landing upon one of their shores. If, for the purpose of making the said rivers navigable, or for maintaining them in such state, it should be necessary or advantageous to establish any tax or contribution, this shall not be done without the consent of both Governments. The stipulations contained in the present article shall not impair the territorial rights of either republic within its established limits. The Mexicans who, in the territories aforesaid, shall not preserve the character of citizens of the Mexican Republic, conformably with what is stipulated in the preceding article, shall be incorporated into the Union of the United States. and be admitted at the proper time (to be judged of by the Congress of the United States) to the enjoyment of all the rights of citizens of the United States, according to the principles of the Constitution; and in the mean time, shall be maintained and protected in the free enjoyment of their liberty and property, and secured in the free exercise of their religion without; restriction. Considering that a great part of the territories, which, by the present treaty, are to be comprehended for the future within the limits of the United States, is now occupied by savage tribes, who will hereafter be under the exclusive control of the Government of the United States, and whose incursions within the territory of Mexico would be prejudicial in the extreme, it is solemnly agreed that all such incursions shall be forcibly restrained by the Government of the United States whensoever this may be necessary; and that when they cannot be prevented, they shall be punished by the said Government, and satisfaction for the same shall be exactedall in the same way, and with equal diligence and energy, as if the same incursions were meditated or committed within its own territory, against its own citizens. It shall not be lawful, under any pretext whatever, for any inhabitant of the United States to purchase or acquire any Mexican, or any foreigner residing in Mexico, who may have been captured by Indians inhabiting the territory of either of the two republics; nor to purchase or acquire horses, mules, cattle, or property of any kind, stolen within Mexican territory by such Indians. And in the event of any person or persons, captured within Mexican territory by Indians, being carried into the territory of the United States, the Government of the latter engages and binds itself, in the most solemn manner, so soon as it shall know of such captives being within its territory, and shall be able so to do, through the faithful exercise of its influence and power, to rescue them and return them to their country. or deliver them to the agent or representative of the Mexican Government. The Mexican authorities will, as far as practicable, give to the Government of the United States notice of such captures; and its agents shall pay the expenses incurred in the maintenance and transmission of the rescued captives; who, in the mean time, shall be treated with the utmost hospitality by the American authorities at the place where they may be. But if the Government of the United States, before receiving such notice from Mexico, should obtain intelligence, through any other channel, of the existence of Mexican captives within its territory, it will proceed forthwith to effect their release and delivery to the Mexican agent, as above stipulated. For the purpose of giving to these stipulations the fullest possible efficacy, thereby affording the security and redress demanded by their true spirit and intent, the Government of the United States will now and hereafter pass, without unnecessary delay, and always vigilantly enforce, such laws as the nature of the subject may require. And, finally, the sacredness of this obligation shall never be lost sight of by the said Government, when providing for the removal of the Indians from any portion of the said territories, or for its being settled by citizens of the United States; but, on the contrary, special care shall then be taken not to place its Indian occupants under the necessity of seeking new homes, by committing those invasions which the United States have solemnly obliged themselves to restrain. In consideration of the extension acquired by the boundaries of the United States, as defined in the fifth article of the present treaty, the Government of the United States engages to pay to that of the Mexican Republic the sum of fifteen millions of dollars. Immediately after the treaty shall have been duly ratified by the Government of the Mexican Republic, the sum of three millions of dollars shall be paid to the said Government by that of the United States, at the city of Mexico, in the gold or silver coin of Mexico The remaining twelve millions of dollars shall be paid at the same place, and in the same coin, in annual installments of three millions of dollars each, together with interest on the same at the rate of six per centum per annum. This interest shall begin to run upon the whole sum of twelve millions from the day of the ratification of the present treaty by--the Mexican Government, and the first of the installments shall be paid-at the expiration of one year from the same day. Together with each annual installment, as it falls due, the whole interest accruing on such installment from the beginning shall also be paid. The United States engage, moreover, to assume and pay to the claimants all the amounts now due them, and those hereafter to become due, by reason of the claims already liquidated and decided against the Mexican Republic, under the conventions between the two republics severally concluded on the eleventh day of April, eighteen hundred and thirty-nine, and on the thirtieth day of January, eighteen hundred and forty-three; so that the Mexican Republic shall be absolutely exempt, for the future, from all expense whatever on account of the said claims. The United States do furthermore discharge the Mexican Republic from all claims of citizens of the United States, not heretofore decided against the Mexican Government, which may have arisen previously to the date of the signature of this treaty; which discharge shall be final and perpetual, whether the said claims be rejected or be allowed by the board of commissioners provided for in the following article, and whatever shall be the total amount of those allowed. The United States, exonerating Mexico from all demands on account of the claims of their citizens mentioned in the preceding article, and considering them entirely and forever canceled, whatever their amount may be, undertake to make satisfaction for the same, to an amount not exceeding three and one-quarter millions of dollars. To ascertain the validity and amount of those claims, a board of commissioners shall be established by the Government of the United States, whose awards shall be final and conclusive; provided that, in deciding upon the validity of each claim, the boa shall be guided and governed by the principles and rules of decision prescribed by the first and fifth articles of the unratified convention, concluded at the city of Mexico on the twentieth day of November, one thousand eight hundred and forty-three; and in no case shall an award be made in favour of any claim not embraced by these principles and rules. If, in the opinion of the said board of commissioners or of the claimants, any books, records, or documents, in the possession or power of the Government of the Mexican Republic, shall be deemed necessary to the just decision of any claim, the commissioners, or the claimants through them, shall, within such period as Congress may designate, make an application in writing for the same, addressed to the Mexican Minister of Foreign Affairs, to be transmitted by the Secretary of State of the United States; and the Mexican Government engages, at the earliest possible moment after the receipt of such demand, to cause any of the books, records, or documents so specified, which shall be in their possession or power (or authenticated copies or extracts of the same), to be transmitted to the said Secretary of State, who shall immediately deliver them over to the said board of commissioners; provided that no such application shall be made by or at the instance of any claimant, until the facts which it is expected to prove by such books, records, or documents, shall have been stated under oath or affirmation. Each of the contracting parties reserves to itself the entire right to fortify whatever point within its territory it may judge proper so to fortify for its security. The treaty of amity, commerce, and navigation, concluded at the city of Mexico, on the fifth day of April, A. D. 1831, between the United States of America and the United Mexican States, except the additional article, and except so far as the stipulations of the said treaty may be incompatible with any stipulation contained in the present treaty, is hereby revived for the period of eight years from the day of the exchange of ratifications of this treaty, with the same force and virtue as if incorporated therein; it being understood that each of the contracting parties reserves to itself the right, at any time after the said period of eight years shall have expired, to terminate the same by giving one year's notice of such intention to the other party. All supplies whatever for troops of the United States in Mexico, arriving at ports in the occupation of such troops previous to the final evacuation thereof, although subsequently to the restoration of the custom-houses at such ports, shall be entirely exempt from duties and charges of any kind; the Government of the United States hereby engaging and pledging its faith to establish and vigilantly to enforce, all possible guards for securing the revenue of Mexico, by preventing the importation, under cover of this stipulation, of any articles other than such, both in kind and in quantity, as shall really be wanted for the use and consumption of the forces of the United States during the time they may remain in Mexico. To this end it shall be the duty of all officers and agents of the United States to denounce to the Mexican authorities at the respective ports any attempts at a fraudulent abuse of this stipulation, which they may know of, or may have reason to suspect, and to give to such authorities all the aid in their power with regard thereto; and every such attempt, when duly proved and established by sentence of a competent tribunal, They shall be punished by the confiscation of the property so attempted to be fraudulently introduced. (1) All such merchandise, effects, and property, if imported previously to the restoration of the custom-houses to the Mexican authorities, as stipulated for in the third article of this treaty, shall be exempt from confiscation, although the importation of the same be prohibited by the Mexican tariff. (2) The same perfect exemption shall be enjoyed by all such merchandise, effects, and property, imported subsequently to the restoration of the custom-houses, and previously to the sixty days fixed in the following article for the coming into force of the Mexican tariff at such ports respectively; the said merchandise, effects, and property being, however, at the time of their importation, subject to the payment of duties, as provided for in the said following article. (3) All merchandise, effects, and property described in the two rules foregoing shall, during their continuance at the place of importation, and upon their leaving such place for the interior, be exempt from all duty, tax, or imposts of every kind, under whatsoever title or denomination. Nor shall they be there subject to any charge whatsoever upon the sale thereof. (4) All merchandise, effects, and property, described in the first and second rules, which shall have been removed to any place in the interior, whilst such place was in the occupation of the forces of the United States, shall, during their continuance therein, be exempt from all tax upon the sale or consumption thereof, and from every kind of impost or contribution, under whatsoever title or denomination. (5) But if any merchandise, effects, or property, described in the first and second rules, shall be removed to any place not occupied at the time by the forces of the United States, they shall, upon their introduction into such place, or upon their sale or consumption there, be subject to the same duties which, under the Mexican laws, they would be required to pay in such cases if they had been imported in time of peace, through the maritime custom-houses, and had there paid the duties conformably with the Mexican tariff. (6) The owners of all merchandise, effects, or property, described in the first and second rules, and existing in any port of Mexico, shall have the right to reship the same, exempt from all tax, impost, or contribution whatever. With respect to the metals, or other property, exported from any Mexican port whilst in the occupation of the forces of the United States, and previously to the restoration of the custom-house at such port, no person shall be required by the Mexican authorities, whether general or state, to pay any tax, duty, or contribution upon any such exportation, or in any manner to account for the same to the said authorities. Through consideration for the interests of commerce generally, it is agreed, that if less than sixty days should elapse between the date of the signature of this treaty and the restoration of the custom houses, conformably with the stipulation in the third article, in such case all merchandise, effects and property whatsoever, arriving at the Mexican ports after the restoration of the said custom-houses, and previously to the expiration of sixty days after the day of signature of this treaty, shall be admitted to entry; and no other duties shall be levied thereon than the duties established by the tariff found in force at such custom-houses at the time of the restoration of the same. And to all such merchandise, effects, and property, the rules established by the preceding article shall apply. If unhappily any disagreement should hereafter arise between the Governments of the two republics, whether with respect to the interpretation of any stipulation in this treaty, or with respect to any other particular concerning the political or commercial relations of the two nations, the said Governments, in the name of those nations, do promise to each other that they will endeavour, in the most sincere and earnest manner, to settle the differences so arising, and to preserve the state of peace and friendship in which the two countries are now placing themselves, using, for this end, mutual representations and pacific negotiations. And if, by these means, they should not be enabled to come to an agreement, a resort shall not, on this account, be had to reprisals, aggression, or hostility of any kind, by the one republic against the other, until the Government of that which deems itself aggrieved shall have maturely considered, in the spirit of peace and good neighbourship, whether it would not be better that such difference should be settled by the arbitration of commissioners appointed on each side, or by that of a friendly nation. And should such course be proposed by either party, it shall be acceded to by the other, unless deemed by it altogether incompatible with the nature of the difference, or the circumstances of the case. (1) The merchants of either republic then residing in the other shall be allowed to remain twelve months (for those dwelling in the interior), and six months (for those dwelling at the seaports) to collect their debts and settle their affairs; during which periods they shall enjoy the same protection, and be on the same footing, in all respects, as the citizens or subjects of the most friendly nations; and, at the expiration thereof, or at any time before, they shall have full liberty to depart, carrying off all their effects without molestation or hindrance, conforming therein to the same laws which the citizens or subjects of the most friendly nations are required to conform to. Upon the entrance of the armies of either nation into the territories of the other, women and children, ecclesiastics, scholars of every faculty, cultivators of the earth, merchants, artisans, manufacturers, and fishermen, unarmed and inhabiting unfortified towns, villages, or places, and in general all persons whose occupations are for the common subsistence and benefit of mankind, shall be allowed to continue their respective employments, unmolested in their persons. Nor shall their houses or goods be burnt or otherwise destroyed, nor their cattle taken, nor their fields wasted, by the armed force into whose power, by the events of war, they may happen to fall; but if the necessity arise to take anything from them for the use of such armed force, the same shall be paid for at an equitable price. All churches, hospitals, schools, colleges, libraries, and other establishments for charitable and beneficent purposes, shall be respected, and all persons connected with the same protected in the discharge of their duties, and the pursuit of their vocations. (2). In order that the fate of prisoners of war may be alleviated all such practices as those of sending them into distant, inclement or unwholesome districts, or crowding them into close and noxious places, shall be studiously avoided. They shall not be confined in dungeons, prison ships, or prisons; nor be put in irons, or bound or otherwise restrained in the use of their limbs. The officers shall enjoy liberty on their paroles, within convenient districts, and have comfortable quarters; and the common soldiers shall be dispose( in cantonments, open and extensive enough for air and exercise and lodged in barracks as roomy and good as are provided by the party in whose power they are for its own troops. But if any office shall break his parole by leaving the district so assigned him, o any other prisoner shall escape from the limits of his cantonment after they shall have been designated to him, such individual, officer, or other prisoner, shall forfeit so much of the benefit of this article as provides for his liberty on parole or in cantonment. And if any officer so breaking his parole or any common soldier so escaping from the limits assigned him, shall afterwards be found in arms previously to his being regularly exchanged, the person so offending shall be dealt with according to the established laws of war. The officers shall be daily furnished, by the party in whose power they are, with as many rations, and of the same articles, as are allowed either in kind or by commutation, to officers of equal rank in its own army; and all others shall be daily furnished with such ration as is allowed to a common soldier in its own service; the value of all which supplies shall, at the close of the war, or at periods to be agreed upon between the respective commanders, be paid by the other party, on a mutual adjustment of accounts for the subsistence of prisoners; and such accounts shall not be mingled with or set off against any others, nor the balance due on them withheld, as a compensation or reprisal for any cause whatever, real or pretended Each party shall be allowed to keep a commissary of prisoners, appointed by itself, with every cantonment of prisoners, in possession of the other; which commissary shall see the prisoners as often a he pleases; shall be allowed to receive, exempt from all duties a taxes, and to distribute, whatever comforts may be sent to them by their friends; and shall be free to transmit his reports in open letters to the party by whom he is employed. And it is declared that neither the pretense that war dissolves all treaties, nor any other whatever, shall be considered as annulling or suspending the solemn covenant contained in this article. On the contrary, the state of war is precisely that for which it is provided; and, during which, its stipulations are to be as sacredly observed as the most acknowledged obligations under the law of nature or nations. This treaty shall be ratified by the President of the United States of America, by and with the advice and consent of the Senate thereof; and by the President of the Mexican Republic, with the previous approbation of its general Congress; and the ratifications shall be exchanged in the City of Washington, or at the seat of Government of Mexico, in four months from the date of the signature hereof, or sooner if practicable. In faith whereof we, the respective Plenipotentiaries, have signed this treaty of peace, friendship, limits, and settlement, and have hereunto affixed our seals respectively. Done in quintuplicate, at the city of Guadalupe Hidalgo, on the second day of February, in the year of our Lord one thousand eight hundred and forty-eight. Recommended Reading: The Treaty of Guadalupe Hidalgo (Origin, Disputes, Causes and Effects); American Expansionism; Mexican American War; Battle of the Alamo.